The U.S. Catholic bishops meeting this week in Baltimore voted overwhelmingly today to adopt and promulgate a new pastoral letter on racism, the first since 1979’s “Brothers and Sisters Unto Us.” “Open Wide Our Hearts: The Enduring Call to Love” describes racism as an “ugly cancer [that] still infects our nation.” The letter also condemns the rise of anti-Semitism, anti-Muslim sentiment and xenophobia. Other topics such as police brutality, the water crisis in Flint, Mich., mass incarceration, and housing and educational discrimination are also highlighted in the letter. The vote to accept the letter was 241 to three, with one abstention. It is expected to be released by the bishops’ conference on Nov. 14. U.S. bishops formed a committee last year to address what church officials have described as a resurgence of racism and bigotry in the United States and in the Catholic Church. 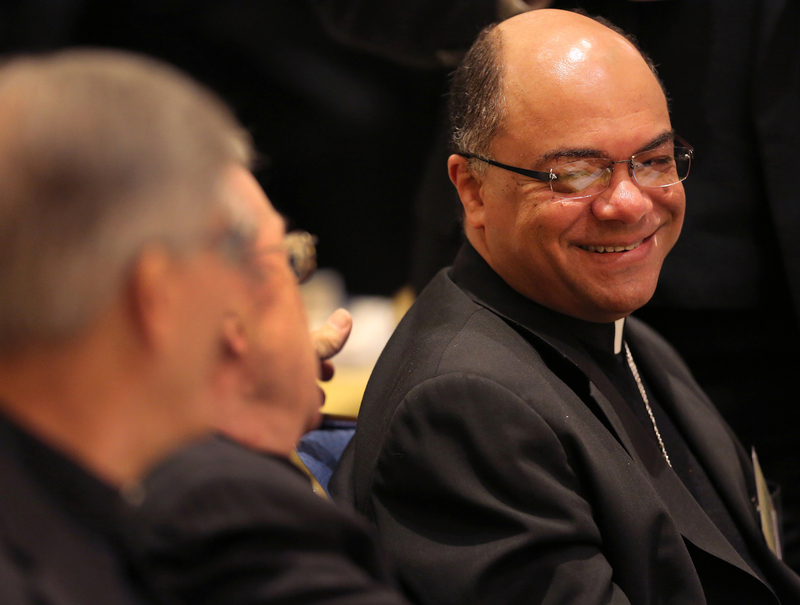 “The church offers much to embrace in its history of being proactive in race relations, as well as some sad and harmful actions from the past to reject,” Bishop Shelton J. Fabre of Houma-Thibodaux, La., who chairs the committee, told America. Unlike the 1979 pastoral letter, “Open Wide Our Hearts” is much more explicit about the oppression faced by Native Americans, African-Americans and Hispanics throughout history. The committee worked with the U.S. Conference of Catholic Bishops’ Committee on Cultural Diversity to draft the new pastoral letter. Unlike the 1979 pastoral letter, “Open Wide Our Hearts” is much more explicit about the oppression faced by Native Americans, African-Americans and Hispanics throughout history. Each group receives their own section and attention is given to the particular oppression each group has faced, including the effects of colonialism on Native Americans and the role of chattel slavery on black Americans. Bishop Fabre believes that the anti-racism committee and “Open Wide Our Hearts” can play a crucial role in the fight against racism. The new pastoral letter acknowledges that words will not be enough to root out racism in the United States. It states that Catholics must acknowledge their own sinfulness and the ways they have been complicit in the evil of racism. Catholics, the letter continues, must educate themselves and work toward dismantling systemic forms of oppression because racism goes against human life and dignity. It states that the church must be as outspoken against racism as it is against abortion, assisted suicide and the death penalty. Much of the discussion of the letter before the vote was laudatory, thanking the creators for their work because of what several bishops said is a rise in racist views being expressed in public. “The church offers much to embrace in its history of being proactive in race relations, as well as some sad and harmful actions from the past to reject." There was some back-and-forth during the amendment process, particularly around controversial issues such as the Confederate flag and the role of police in society. Bishop John Stowe, who heads the Diocese of Lexington, said before the vote that he appreciated the timeliness of the letter because some Catholic media employ language that is disparaging of diversity. During the meeting, bishops also voted to advance the sainthood cause of Sister Thea Bowman, the granddaughter of slaves and the first African-American member of the Franciscan Sisters of Perpetual Adoration, who transcended racism in the United States in the late 20th century. Sister Bowman was the first African-American religious sister from Canton, Miss., the first to head an office of intercultural awareness and the first African-American woman to address the U.S. Conference of Catholic Bishops. Speaking before the vote, Cardinal Seán O’Malley said of Sister Bowman, “Her life touched the lives of so many people,” adding that Catholics in the Virgin Islands, where he served as a bishop, “revere” her. Shall I hold my breath to hear this letter read to the Parishioners in the Pews ? I doubt it will be read at the Parish Level. Most likely just to be published in the Diocese Newspaper so not to offend Conservative Donors. Your evil "Conservative Donors" are the ones, amongst others, committing tens to hundreds of thousands of dollars every year to Catholic schools in the inner city. "Remove the log in thine eye before you remove the splinter in mine." I did not say or did not mean Conservative Donors are evil. My point being that messages that need to get down to the parishioners in the Pews are avoided not to offend politically Conservative Parishioners. Is money the determing factor what Christian messages Pastors weigh on what is said to their Parishioners ? This is why I feel Politics should be taken out of the Church. America, while still flawed in its race relations ... is now the least racist white- majority society in the world; has a better record of legal protection of minorities than any other society, white or black; offers more opportunities to a greater number of black persons than any other society, including all those of Africa . 1. What percent of the U.S. adult population are racist? Has it been declining or increasing? 2. What forms of racism exist today that must be eliminated...and please be precise? All I ever hear is "we have to have a discussion about racism and not shy away from it". Ok, what are the specific issues that all Americans must discuss and please don't be general. 3. Will this letter by the bishops condemn other forms of hate speech that manifest itself in irresponsible over-the-top political name-calling? We all know that one group of citizens (e.g., all Republicans) that respectfully disagrees with another group (Democrats) on controversial issues such as immigration reform are often called "racist, anti-immigrant, anti-poor, evil, etc"? 4. Will this letter by bishops be a "balanced view of the truth", namely, that much of our current political discourse, including media coverage, is replete of misleading comments, vitriolic and hyperbolic name-calling, half-truths and misleading information. 5. Will bishops ask each parish to read this letter at all Sunday Masses? It is possible to be racist without even recognizing it. Using language that offends... Indians or using black face. The people who have offended may not even realize they have done something hurtful. But I also want to stress that there is a more deliberate form of racism. The Birther movement is an example. I know people who have become very judgmental toward Islam because of terrorism. On the issue of immigration most democrats recognize the need for border protection. No one denies that necessity. But it is wrong, I believe to assume that all of these people are terrorists or criminals. Congress needs to work together to make laws that both protect us while recognizng the benefits brought to this country by immigrants. Some of the attitudes toward immigrants and refugees expressed by the President of this country have nothing to do with truths expressed in the Bible and should be challenged in light of Biblical truths. So yes, I do believe that racism is alive and well in this country and I firmly believe that this letter should be shared and discussed on the parish level. Thanks for your comments. I think a great deal of the problem, whether we are talking about racism or immigration, is the ill-effects of hyper-partisan rhetoric that dominates our political discourse. Consider that Trump never said that 30% or 50% or 90% of all immigrants crossing the border illegally are criminals or terrorists. The media and many democrats take his words and turn them into the most hateful and twisted version of the truth in order to suite their political objectives. The fact is that 90% of immigrants entering the US are entering "illegally". Some of them are criminals, gang members, and drug smugglers. If immigrants or migrants want to claim asylum, they should make this claim at a border crossing which is the procedure. However, the democrats and media do not want this as a solution. They want open borders but they will never say so. In truth, the solution to our immigration problems rest with the Congress, not Trump. Each political party do not want to compromise even when a solid first step comprehensive solution is achievable. Each party would rather point fingers at each other for inaction. Far too often this means using highly vitriolic name calling...such as racist, anti-family, anti-poor, merciless, cold-hearted and evil. Each party fuels a form of racism and it has to stop. Here is my solution. The Congress must secure the border, increase the number of immigrants that can enter the US legally (e.g., from 1 million to 2 million), modify the definition of chain migration and consider some form of merit based system for at least half the newly increased number of immigrants who enter the US legally. Also, a path to citizenship should be made available under certain conditions for the 12 million immigrants in the US today that are not US citizens but are undocumented. I choose to focus on what Trump does (e.g., tax cuts, record low unemployment, a booming economy, fairer trade deals) rather than to over-react to his ill-choosen and inappropriate comments. If you don't like Trump, don't vote for him in 2020. I will wait and see who is running against him in 2020 and what proposals this person is putting forth before I make my decision. If they are anything like what Hilary Clinton proposed, I will either not vote for either candidate for President or vote for Trump. As for the Bishop's letter on racism, unfortunately I have serious doubts that this letter will be read in my parish....which is the largest Catholic parish in the U.S.
Forgive my cynicism BUT, outspoken is not how I hear the Church on “assisted suicide and the death penalty.” Yes, I know we are opposed to it. I see no marches once a year opposed to either, as I do against abortion and for anti-abortion legislation. I now await the requirement to all pastors to preach on the new letter from the Bishops, to hear from the pulpit the various forms by which racism occurs and for which we must convict ourselves of serious sin. Forgive my cynicism again, but I figure that I’ll be dead before that happens. As for the canonization of Thea Bowman, I heartily concur. Her two miracles should be her life of constancy and love in her Catholic faith through years of its subtle racism! What were the apparent reasons of the four bishops who did not vote for the document? This seems to be an important but omitted element of the story.